With the market evolving today, people are getting more confused when it comes to choosing where they will get their water, especially the drinking ones. People choose between drinking tap, bottled or house-filtered water. Studies show that drinking tap water itself can be harmful to the health of any human. It contains lead, chlorine, fluoride and other contaminants that should not be drank by anyone. If you choose to buy bottled water for your family’s drinking purposes, it could be very costly. Choosing water filtration system to be installed in your home can still be difficult because there are a lot of products to choose from. Some of these products only remove a portion of the contaminants and others remove almost all of it which could cause the same dangers to anyone. 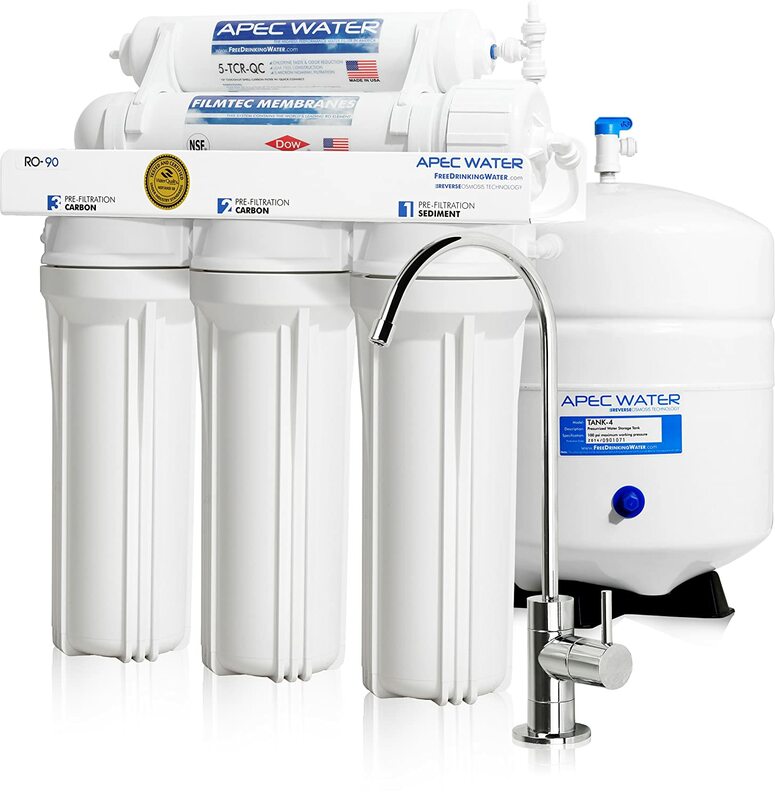 To make your decision easier, the APEC Water – Top Tier RO-90 has been made to ensure that your family will get the best type of water out there. The APEC company has been in this industry for almost 17 years and has been at the top ever since. It’s cheap and very affordable, but it can out power all the other brands. 1st stage: 5 Micron Polypropylene sediment filter that has the super capacity to filter dusts, rusts and particles which also extends and protects both the system and the membrane. 2nd stage: 5 Micron carbon blocks that has the super capacity to eliminate the unpleasant odor, color, tastes, chlorine and other chemicals found in your regular water. 3rd stage: it has the same 5 Micron carbon blocks that further eliminates chlorine, fluoride and other small particle harmful chemicals in the water. 4th stage: High quality FILMTEC with high rejection TFC reverse osmosis membrane that eliminates chemicals like arsenic, lead, fluoride, chlorine, viruses, radium, bacteria and many more. 5th stage: Advanced coconut shell refining carbon filter with Total Contamination Removal (TCR) filter that eliminates any residual taste in both the tank and water. It comes with a lead-free chrome faucet. Warranty: 1 year, but free technical support for the entire lifespan of the system. It’s purely made in the US which ensures a trouble-free system with an assurance of super long-lasting filters. It’s a smart design that automatically shuts off when the system reaches to full capacity. It treats all types of water including tap, well, hard and soft water. Its leak and noise free operation that ensures you that you won’t have to worry in anything. This product is very easy to install with easy to follow instructions in the manual. It only requires low maintenance. You only need to change its 3 ultimate filters once every 12 months. The production rate of this filtration system is 2x faster compared to the other brands. There’s a guarantee that you will have free technical support from the professional team of APEC for the whole life time of you system. It assures 99% contamination free with the clearest, cleanest and best tasting water. One of the concerns of the past buyers is that the housing of the membrane filter is quite difficult to open. But this only happens in some of the units so you don’t have to worry. Some of the buyers also mentioned that after they have purchased the APEC Water – Top Tier RO-90 for a year and they replaced the water filters, their shut off valve failed to operate and needed replacement. When it comes to the safety of your family, the water they drink is very important. With the APEC Water – Top Tier RO-90, you can be rest assured that you’re all in good hands. This product removes 99% of all the contaminants found in your regular water and the operation of this system is leak and noise-free. Plus, it filters 2x faster compared to other brands and can collect up to 4 gallons of water.